It’s all possible on one of our Berber Treasures tours to Morocco. From budget guest houses to 3 star , 4 star, 5 star or ultra luxurious riads in Morocco – your imagination (and budget) is your limitation when it comes to riads in Marrakech, Fes, Essaouira and many other Moroccan cities and towns or Kasbahs in Ouarzazate, Skoura, Todra Gorge and Morocco’s Sahara Desert. Riads in Morocco are traditional Moroccan houses which have been restored and converted into a boutique hotel. Typically they are built around a central courtyard and have between 4 to 8 rooms for guests. The traditional riads in Morocco are designed as a sanctuary from the outside and focus of the rooms is inward looking to the peace and tranquillity of the courtyard and not to the outside views. Kasbahs in Morocco are the original homes and palaces of the Berber from the Morocco desert region – you can see and experience a kasbah on one of our Morocco desert tours. A Moroccan Kasbah is traditionally constructed with mud brick made from rammed earth. The walls are smoothed and the Kasbah can be decorated externally with elaborate brick-work, towers, hand-worked iron window grills and protruding window bays. Like the riads in Morocco, some Kasbahs in Morocco have been transformed into boutique hotels and others purposed built. Berber Treasures’ Morocco tours use a variety of accommodation. Our selections and recommendations depend on the itinerary you have chosen for your holiday in Morocco and are based on factors such as location, ambience, authenticity and comfort. To get the most out of your Morocco travel experience we recommend you stay in Kasbahs and riads in Morocco as much as possible as well giving into your adventurous spirit and trying at least one night camping in a Berber nomad tent. If you choose one of Berber Treasures private tours of Morocco you have the freedom to choose the style and standard of your accommodation as we will tailor our Morocco travel itineraries to suit your personal interests and accommodation preferences. And if you choose one of our Berber Treasures small group tours to Morocco, you can be confident we have your ultimate Morocco travel experience in mind with our selection of hotels, Kasbahs and riads in Morocco. Berber Treasures Drivers/Guides: On our Morocco tours we use trusted English speaking Moroccan driver/guides who are experts in Morocco travel. Many of them are from the same extended family and they all bring with them the great Moroccan sense of family respect and love of life that will see them looking after you on your Berber Treasures Morocco travel adventure as if you were an exalted member of the tribe. Many of our driver/guides also speak other languages including French, Spanish and Italian, in addition, to their native Berber and Moroccan Arabic. Please advise us if you have special language requirements – we will do our best to accommodate you during your holiday in Morocco on our unique Morocco tours. You will be met and accompanied by one of our Berber Treasures drivers throughout your holiday in Morocco. Where possible your driver/guide will make suggestions and reservations for restaurants, entertainment, shopping and optional activities and can assist with hotel check-in documentation (local authorities require various details to be provided) and provide guidance with local customs and culture. Please be assured your Berber Treasures driver will do his best to help you with all aspects of your holiday in Morocco however, he is not permitted to engage in bargaining for any purchases you may wish to make. For the comfort and safety of all on our Morocco tours we require all of our driver/guides to break for lunch and to refresh every few hours when driving. We ask you to bear this in mind if at one time or another you do not feel particularly in need of lunch or a break yourself. Local Guides in Morocco: Generally, we use local guides only for specified city tours in Morocco. Local Guides are independent operators registered by the particular local government authority as a licensed local guide for a particular location or city. They are not Berber Treasures’ employees. Your personalised Morocco tour itinerary will indicate those activities where a local guide is included. On Berber Treasures Morocco tours if you wish to use a local guide at other locations this can be included (on request and where available) in your Morocco travel and tour itinerary. Alternatively, local guides may be available at some sights on arrival. In which case, if you wish you can negotiate a price with one of these local guides on arrival. As with other bargaining, your driver is not permitted to negotiate on your behalf for the guide’s services. Your Berber Treasures Morocco driver/guide can help you with notable aspects of the various sights during your Morocco tour, but generally he will not be able to guide around you them. By local law, your driver/guide is not permitted to act as your official guide through locations such as the medinas on your city tours of Marrakech and Fez. Moroccan law allows only licensed local guides to guide tourists on city tours of Fez, Marrakech, Meknes, Essaouira and other Moroccan cites and also for historical sites such as tours of Volubilis. Group Size: If you choose a Berber Treasures Morocco private tour we can cater for a party of any size regardless of whether you are travelling alone, with family or friends or with a large group. If you prefer Berber Treasures’ small group tours of Morocco, numbers are strictly limited. The Climate: The climate in Moroccan varies both seasonally and by geographic zones. Along the coastline the average daytime temperature ranges from about 12°C in winter (December through February) to 25°C in summer (June through July). In the mountains the winter daytime temperature may drop as low as minus 20°C in the highest areas, with snow sometimes blocking the high mountain passes such as Tizi n’Tichka (2260m) and Tizi n’Test (2092m). During the summer the temperature rises to a pleasant, cool daytime average of around 15°C. In contrast, the average daytime temperature in the Morocco desert areas in the south of the country ranges from 17°C in the winter to 40°C in summer. We operate our Berber Treasures Morocco tours throughout the year. * Estimated dates only. The actual date depends on the local sighting of the moon and could be +/- 1 day. Ramadan: During 2019 Ramadan is estimated to commence around 6/7 May. Ramadan, which lasts for approximately 4 weeks is a period of fasting for Muslims and observed widely throughout Morocco. Taking your holidays in Morocco during Ramadan offers a uniquely different Morocco tour experience to enjoyed by tourists who holiday in Morocco at other times of the year. In general the tourist cafes, restaurants and sights are open a little later in the morning during Ramadan. You can expect your Berber Treasures Morocco driver and the local guides of Morocco will observe Ramadan neither eating nor drinking between sunrise and sunset. You will not be expected to fast and will be able to obtain food and drinks during the day. However, we ask that you be aware of and understanding that your driver and local guides used for Morocco city tours will break their fast at sundown. Feast of the Sacrifice: Also known as the Feast of the Sheep is a holiday enjoyed and celebrated together with family. The day of the official holiday and the following day or so is a quieter time in Morocco. Historical sights are generally open. In the larger cities such as Marrakech and Fez the markets and souks will be operating but will likely be somewhat quieter than usual. The markets and souks generally return to full vibrancy within three to four days or so following the holiday. You will not be able to purchase alcohol from liquor stores during this period. Electricity: The electricity throughout Morocco is 220V though you may find some 110V outlets in some hotels and riads in Morocco. You will need the European style adaptor that has a rounded cylinder with two-cylindrical prongs. Food & Drinks: Moroccan food is usually a delicious freshly, cooked meal with lunch and dinner being the main meals. While spicy and aromatic, typically, Moroccan dishes are not hot like some Indian and South East Asian food. Each region is known for its own speciality dishes. Commercially bottled water and most popular non-alcoholic drinks are readily available. You should not drink untreated tap water. Tea is universally dunk and used as a welcoming drink by Moroccans. Moroccan tea, which is not to be missed, is a type of green tea often blended with fresh mint and always with a lot of sugar. Morocco produces excellent red wine which tourists can freely purchase from liquor stores in larger cities and towns. Larger hotels and tourist restaurants generally serve alcohol. Internet: Internet cafes are found in most cities and towns and in many larger villages. Increasingly hotels, kasbahs and riads in Morocco are offering guests wi-fi internet access. If you are taking one of our Morocco desert tours internet access may be limited – please ask us for details. Language: Arabic and Tamazight (an Amazigh (Berber) language) are the country’s official languages. French is relatively widely spoken in business and in tourist areas. Outside of hotels, restaurants and shops catering for tourists, English is not widely spoken. Money: The Moroccan currency is the Dirham. Cash or travellers cheques in most major currencies can be readily exchanged for Dirhams in banks and larger hotels. You will not be able to exchange Australian or New Zealand currency. We recommend US dollars or Euros as the most convenient currency (travellers’ cheques and cash) to carry on your Morocco tour. You can also use your automatic teller (ATM) card or credit card (including many Australian and New Zealand ATM and credit cards) to withdraw cash, Dirhams, from your own account at many Moroccan bank ATMs in most cities and towns provided your bank is part of the international electronic banking network (eg CIRRUS). You should check with your bank before departing. Although accepted at many mid-larger sized hotels and some restaurants and shops catering to tourists, credit cards are not widely accepted in Morocco. You must remember to exchange your Dirhams before departing Morocco at the end of your Morocco tour. You will not be able to exchange your Dirhams outside of Morocco. Moroccan Ethnicity: The major ethnic groups in Morocco are Imazighen (Berber), Arab or Imazighen-Arab. The principal minor ethnic groups include Jewish and European. Getting There: Some airlines offer direct flights to Morocco from the Europe, Canada, the US and the Middle East (eg Emirates, Ethiad, Royal Air Maroc, most major and some discount European airlines). There are no direct flights between Morocco and Australia or New Zealand. For travel from Australia or New Zealand, generally, the more convenient routes are via the United Arab Emirates or the United Kingdom, France or Spain. Your travel agent should be able to assist you booking flights or you may wish to contact one of the airlines directly. 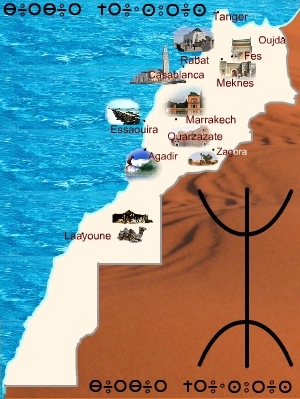 It is also possible to travel to Morocco by ferry from several European ports. Safety: The tourism industry is very important to Morocco. Accordingly, the Moroccan authorities actively promote tourist safety. There are tourist police offices in every major city. Nevertheless, you should check government travel alerts and warnings before departing to Morocco. Tipping: Tipping is part of Moroccan culture and is expected for acceptable service received from, for example, drivers, local guides, hotel porters, café waiters, restaurant waiters, taxi drivers and toilet attendants. Women Travellers: Morocco is a Muslim country. Women travellers who are courteous and respectful toward the people, culture and religion of Morocco will themselves be treated with courtesy and respect. To avoid unwanted attention, we recommend you dress modestly in loose fitting clothes that cover your shoulders, upper arms and knees. Ultimately it is a matter of your own discretion but we suggest you avoid wearing strappy or tight shirts and dresses, skirts or dresses hemmed above the knee or shorts when you are in public. It is unnecessary to wear a head scarf or jelaba (a loose fitting gown, or equivalent, worn by Moroccan women in public). Generally, your travelling experience in Morocco should be a positive one. If you are alone or with other women in crowded areas of Marrakech’s Djemaa el Fna Square at night it is possible you may be deliberately touched or pinched but that is usually the extent of uninvited physical contact. While it is possible for unpleasant situations to occur, they are, however, the exception and not the rule. Wheelchair Access in Morocco: For clients who require a wheelchair we would be delighted to take you on one of our Berber Treasures Morocco private tours. Our experience conducting wheelchair and disabled access tours to Morocco helps ensure your Morocco travel experience is as comfortable and enjoyable as possible. We can help you with what to expect locally in terms of wheelchair access and easy of mobility, and the flexibility of our Morocco tours allows us to design a Morocco travel itinerary that best suits your personal circumstances and interests.